Most people respond that it must be the worst it’s ever been. But Hindrichs, senior environmental scientist for the Louisiana Department of Environmental Quality (LDEQ), sets them straight. “Nope, not even close,” Hindrichs tells them. Today, he is one of the LDEQ’s highest-ranking decision makers for monitoring and improving water quality in Louisiana, but he still advocates public awareness of water sustainability by talking to groups from kindergarteners to public leaders. According to Hindrichs, water quality has significantly improved since the passing of the Clean Water Act in 1972. Part of this success, he says, is because many chemical plants are highly regulated. The greater threat to water quality may be surprising: things like land runoff and seepage from parking lots and agricultural fields thick with pesticides and fertilizers. These nonpoint-source water pollutants find their way into streams and are responsible for the majority of water pollution in the country. Perhaps the biggest fight of Hindrichs’ career began on Aug. 29, 2005, when Hurricane Katrina reached Louisiana and flooded New Orleans with tens of billions of gallons of water. Staggering amounts of debris in that water began to decay, producing bacteria that posed major potential environmental hazards. His field staff tested countless water samples from Lake Pontchartrain, streams and bayous in hopes of determining the contamination’s effects on the aquatic ecosystem. “We didn’t realize the magnitude of Katrina early on, but it didn’t take long for us to figure out we were going to be heavily involved in assessing the situation,” Hindrichs recalled. Today, their focus has shifted to newer concerns such as emerging contaminants, which are chemicals that had not been detected in the water previously but now are being found at higher rates than expected. Hindrichs says public awareness of water issues has improved, but until environmentally friendly lifestyles are practiced on a larger scale and politicians begin supporting stricter regulations, complications with water quality will persist. “We’re all contributors, and therefore we’re all our responsible,” Hindrichs said. Each May for the past 15 years, Hindrichs has led a group of about 30 disabled or special-needs children on an afternoon of canoeing and wildlife observation. It started as something he did for a handful of children but has since grown into a community-wide event with volunteers from the LDEQ and Louisiana State University. For these efforts, Hindrichs was presented the Blue Cross Blue Shield of Louisiana Angel Award, which recognizes volunteers who perform extraordinary work serving children’s needs. “I just hope some of the work I do will inspire younger generations,” he said. A St. Louis native, Albert Hindrichs studied Biology at St. Mary’s University before earning a master’s in Wildlife Management from Louisiana State University. He joined the Louisiana Department of Environmental Quality as an environmental scientist in the Office of Environmental Service. 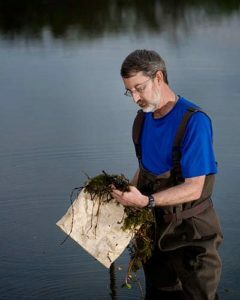 Earlier this year, Hindrichs was named as senior environmental scientist.